It has nearly been a decade since I first dined at what would become my favorite phở restaurant - Phở 79 in Garden Grove. Then I discovered it was Duc's favorite as well. 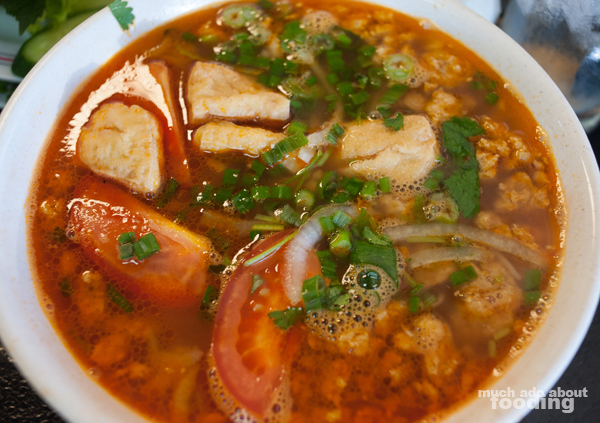 The more people we asked who had lived in Orange County for some time and enjoyed the traditional Vietnamese noodle soup dish, the more we heard that this restaurant, established back in 1979, was their favorite spot as well for the iconic bowl. I've written a handful of times about this eatery in the nascence of Much Ado About Fooding but never followed up with photos that did the food more justice. 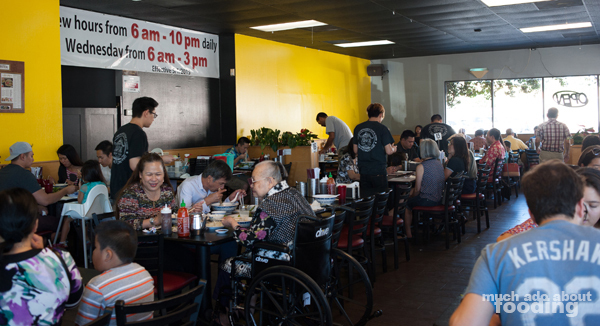 We decided we needed to confess once again that even after all of these years of trying out other phở places, we still hold Phở 79 in the number one spot for phở in Orange County. The potholed parking lot and constant fullness inside are just a few testaments to its greatness. 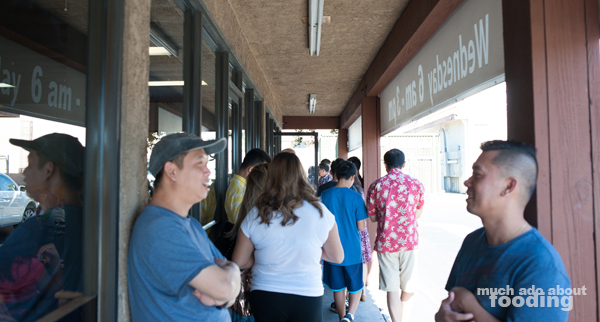 We frequent Phở 79 fairly often but rarely on the weekends; when we did arrive to bring another group of friends to our favorite joint (this time on a Saturday afternoon), we saw the long, wrapping line that would easily attract others to the restaurant. I say "would" though because one of the unfortunate (and also somewhat fortunate) features of its location is that it is hidden from a view from the nearest major street. The cash-only bustling eatery is situated tucked behind a liquor store-focused strip of buildings, and the parking lot is in quite a state of disrepair. On a rare occasion will you find a parking spot immediately; most of the time, you may opt to go into nearby neighborhoods to park and just over. Also, to note, this is what you would expect of an old school Vietnamese restaurant. You enter, they yell at you asking for how many seats you need, they wave you in the general direction of an empty area, and you receive menus unceremoniously. The wait staff will usually also give you about one minute to make a decision before whisking away the menus with a quick about-turn. This isn't about being rude; this is just how service commonly is in a family-run business like this and frankly, we like it. If the lack of service starts to rub you the wrong way, just assure yourself of getting phở here by glancing at the wall full of high Zagat ratings. You know you're in for a treat. While we do point out that we love the phở here, we cannot dismiss how rock-solid the other dishes at Phở 79 also are. On this particular visit, we brought some friends who had never been and made sure to order more than just the phở. 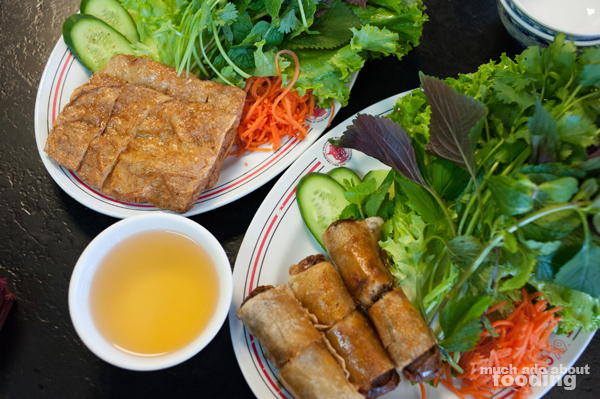 For starters, the table opted for Tàu Hũ Ky (bean curd with ground shrimp) and Chả Giò (Vietnamese egg rolls). 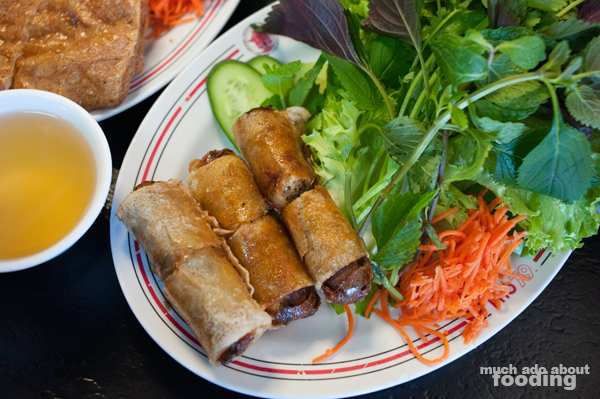 These were perfectly executed with a generous amount of greens to wrap the fried pieces with. I especially loved how flavorful and stuffed the bean curd was, and everyone really enjoyed the filling and resounding crunch of each egg roll. The right balance of savory and salty was in each as well; we often find that other restaurants are overly salty but these were just right. Also, to be a little different, Duc decided to get one of his favorite orders which is the Bún Riêu (ground shrimp and crab rice noodle soup), a traditional Vietnamese noodle soup dish that not every restaurant offers. It has always been more akin, to us, to eating a home because there are a few components of the soup that make it less appealing for restaurants to serve. The places we have found that have this on their menus seem to take shortcuts in building out this comfort food but Phở 79 takes care to do it right. Full of tomato tang and rich crab umami flavor, their version is wholesome and hearty, perfect for a rainy day or any craving for good ol' fashioned comfort. The rest of the table went ahead and ordered varying types of phở based on what they liked. The beauty in this when it comes to choosing the meat components is that you actually have a choice. I personally like my phở with tripe and tendon but others may just enjoy the brisket and meatballs. 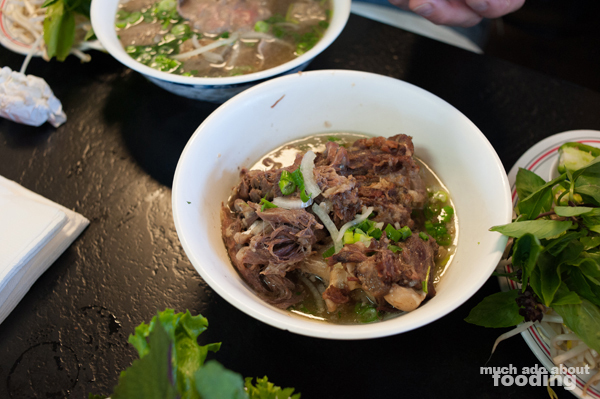 What Phở 79 also carries on a limited first-come-first-serve basis is oxtail either as part of the phở process or on the side. This giant serving of braised, melt-in-your-mouth goodness requires another large bowl to come out in and can be enough for the whole table if ordered once. It is always tender and fatty with more flavor than just beef itself. If you ever are there when these are available, you must try it at least once. As for the phở overall, the broth is always steaming hot when served and tastes of dedication and skill. It is never too oily, and the noodles have always held the exact right amount of bite for us. Every person we've ever brought to the restaurant has deemed it now their favorite as well, and that is a hard claim to make when we live in the land of phở in Orange County. 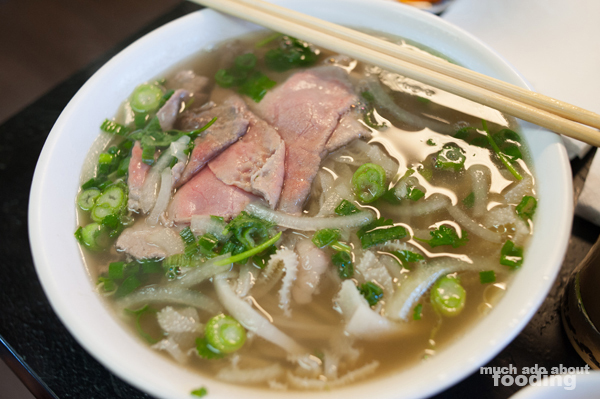 Phở 79 can be found at 9941 Hazard Ave, Garden Grove, CA 92844 behind a liquor store most visible from Brookhurst St. 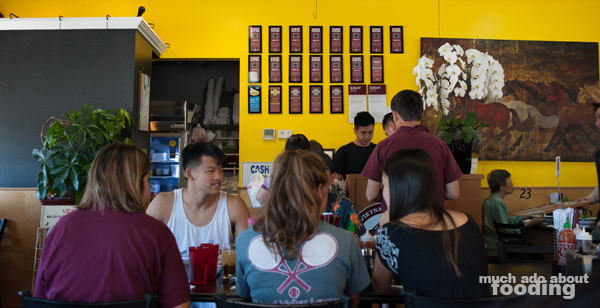 Remember to bring cash for your meal and get ready to seep in the aroma of phở from the moment you walk in. Yep, you'll probably wear that smell on your clothes as well once you get home.